Do you have a Chubby Fashionista in your life? Does she outgrow everything within a week? Here's an inexpensive skirt that will last for a little while. Using ribbon in the waist band lets the skirt expand with her chubby tummy. The finished skirt will be around 8 inches long. Your chubby darling will be able to wear it until it gets too short. Have you looked at bandanas lately? I don't think they're just for cowboys anymore. Bandanas come in all kinds of colors and patterns these days. Around here they range in price from $1.00 to $2.00. You may spend more for the ribbon than for the bandana, but this is an adorable skirt! Fold the bandana in half twice, making a square. Fold in half one more time, being conscious of which way you want the bandana pattern to run on the skirt. Line up the bandana on your cutting board so that two inches can be cut from the top. If you don't care for rotary cutters, just measure down two inches and cut with scissors. Keep the smaller piece of fabric for a Chubby Fashionista Rose Accessory. With right sides facing sew the two larger pieces of bandana together, making one long piece of fabric about 9 inches tall and 43 inches long. Iron the seam flat. Along the top unfinished edge, fold down one half inch of fabric and zig zag. The sewing is easier if you iron this first. Fold down the top edge of fabric again to make a casing. Fold it down about one inch, press, then sew with a straight stitch close to the edge. If your ribbon is extra wide, you may want to make the casing wider than one inch. With right sides together, sew the ends together, up to the casing. Make sure you leave the casing open. Thread a piece of ribon through the casing. I use at least 44 inches of ribbon, sometimes more, depending on how big I want the bow. Generally, the wider the ribbon, the longer I cut the ribbon, so our Chubby Fashionista has a big, honking bow. Sometimes I just use narrow ribbon or even cording and cut the ribbon 44 inches. The wonderful thing about using bandanas is that seam finishing and hemming is already done for you! I can easily make one of these in an evening after work. Below is the finished skirt and Chubby Fashionista Rose Accessory. Of course the best part is dressing your Chubby Fashionista! Here she is in Zebra! Aww..how cute! Nice tutorial! I'd love for you to link these up to my Things I've Done Thursday link party that opens up tonight! What a beautiful skirt. I love your blog. I'm your newest follower. Thanks so much for linking up to Things I've Done Thursday!! Hi, Jamie! Thanks for the invite. Your blog is darling! The Chubby Fashionista and I will join you on Monday! Hey, Melanie - Thank you for your great party! Several views were from your blog this week! 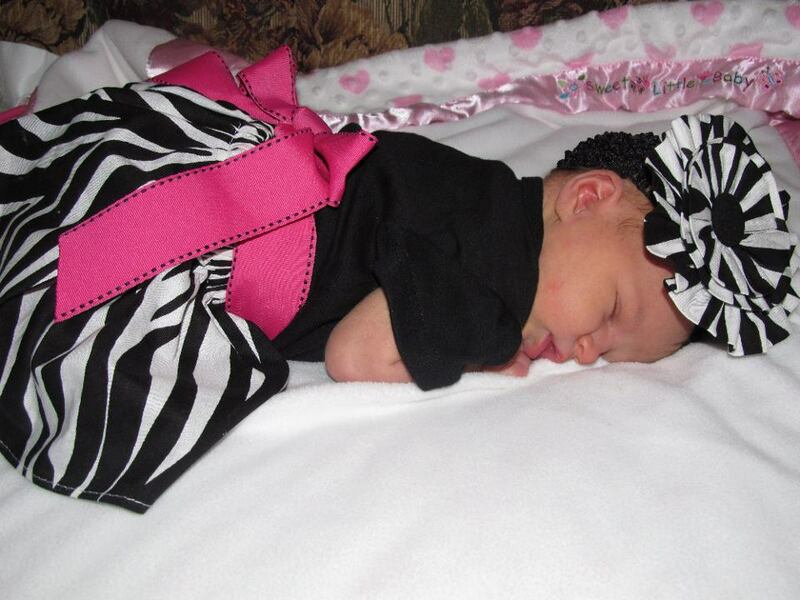 My fashionista is now a teenager-and she just isn't as much fun to dress:) I love the zebra. I love all your sewing crafts! I just started a blog hop and I would be honored if you would link up!! Check it out! This is a great idea. Cute little sleeping baby! What a cutie pie! I love the skirt, but those bows! I guess you make those. I'll have to check those out too. Soap Making Kit - Wow! That was easy!